Every corner of the 2018 Mercedes-Benz GLC 300 4MATIC Coupe has advanced sensors that monitor the surroundings for potential threats. When properly equipped, this compact crossover SUV carries more than 10 active safety features. 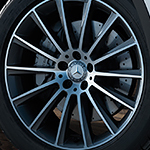 The brilliant engineers at Mercedes-Benz programmed the patented ATTENTION ASSIST module to process up to 70 different factors in real time. By making real-time calculations, this technology determines your risk level of an accident or other misfortune on the road. Thanks to the signature Collision Prevention Assist Plus, you'll get some backup braking leverage in a situation that requires an urgent stop. The BAS Plus with the Cross-Traffic Assist takes quick measures to prevent a crash with another car at an intersection. Carriage House New London encourages customers to check out the 2018 Mercedes-Benz GLC 300 4MATIC Coupe. This compact crossover SUV has radar, optical, ultrasonic and other sensors in cutting-edge safety systems.